https://nashville.bintheredumpthatusa.com/dumpster-rental-murfreesboro	Bin There Dump That Nashville	https://nashville.bintheredumpthatusa.com/img/franchisees/59.jpg	7913 TN-100, Nashville, TN	Contact us for more details. Discover how we make renting a dumpster in Murfreesboro, TN a simple and easy process. Bin There Dump That is committed to making the dumpster rental process for the customer a seamless transaction, from placing an order for the needed dumpster size to delivery of the waste container in Murfreesboro to an immediate pick up when you no longer need the bin on your driveway. Call A Dumpster Consultant Now! Next, our Delivery Experts will bring the dumpster and place it exactly where you want it. When you no longer need the dumpster, give us a call and we’ll pick it up as soon as possible. It’s that easy! Which size dumpster is best for me to rent out? Your project is what determines what size dumpster you should rent out. At Bin There Dump That, we offer wide selection of sizes to cater to any project you may be doing, from 4 yards up to 20 yards. If you’re doing a minor renovation, the 4 yard dumpster would be ideal for you. If you’re doing a major remodel or restoring a house after a natural disaster, the 15 to 20 yard dumpster would be the most ideal to house all the unwanted material. If you’re still unsure, you can call one of our Dumpster Consultants to help you find out which Dumpster is best for you. What does it cost to rent a 10-yard dumpster? 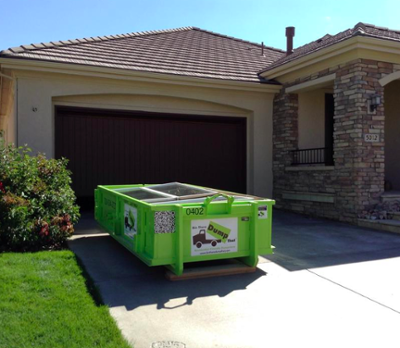 Our 10-yard dumpsters are perfect when you’re refreshing your roof or cleaning up one or two rooms. Prices vary depending on contents of your dumpster and your proximity to the landfill. For a better idea of what your dumpster rental will cost call one of our consultants today for a free quote. Murfreesboro is one of the fastest growing cities in the country located in Rutherford County Tennessee. It's a wonderful city to visit and even better city to live in. In 2006 Money Magazine ranked Murfreesboro as the 84th best places to live in the United States out of 745 cities with a population over 50,000. Home to Middle Tennessee State University which is the largest undergraduate in the State of Tennessee the city prides itself on its education system. If you're ever in the Murfreesboro area and you're looking for something to do, checkout some of our wonderful parks like Old Fort Park which includes baseball fields, tennis courts, playground for children, picnic shelters, bike trail and also a 18 hole championship golf course. There is also Barfield Crescent Park which is also equipped with baseball fields, biking and running trails, picnic areas and a 18 hole championship Disc Golf course. If you're more of the shopping type we have two main malls, Stone River Mall and also The Avenue Murfreesboro where you kind find great deals and great restaurants. Your local Dumpster Rental Murfreesboro, TN dumpster rental operator is Joey Bossier.